Quick Overview: > The metallic core is made with concentrically grooved profiling on both sides. > A notch is turned on the outer circumference of the core in which a loose centering ring. > With soft sealing layer in both sides. RGS Kammprofile Gaskets are composite gaskets, which utilizes a serrated metal core with a soft material. The metal core is machined on each contact face with concentric serrations which provide high pressure areas, ensuring that the soft coating flows into any imperfections in the flange even at relatively low bolt loads. 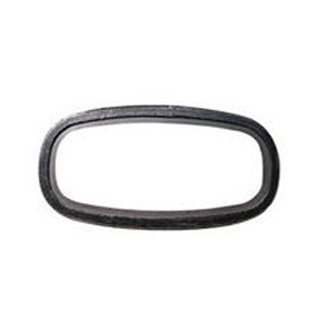 The result is a gasket which combines the benefits of soft cut materials with the advantages or sealing integrity associated with metallic gaskets. Expanded graphite is the most common facing material used for Kammprofile Gaskets. However, other materials can be used, such as PTFE for chemically aggressive duties or mica for high temperature duties, etc. Coating materials: Graphite, PTFE etc. Products are manufactured in accordance with all relevant gasket standards to suit flange designations: ASME B16.5, BS1560, ASME B16.47, BS EN1092, DIN, JIS and NF.